4. Finding limits and triggers. 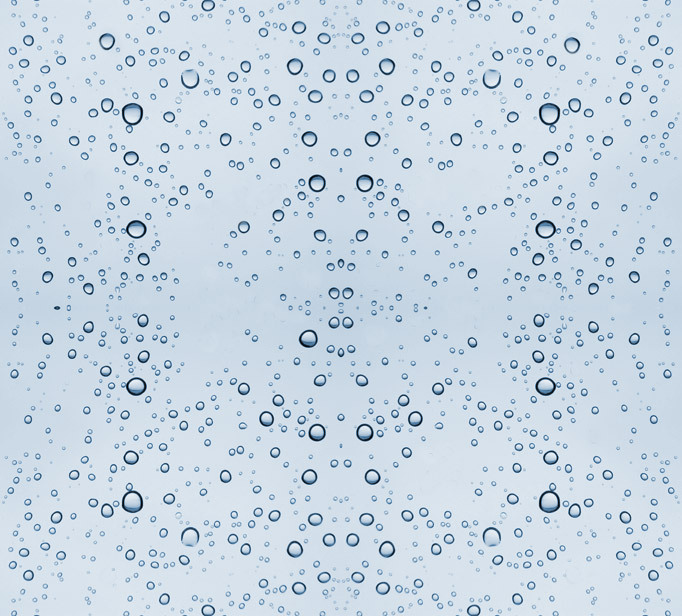 The water or flowing principle is central to IMA, but only receives core attention in water style. The principle is flowing, but not as flowing in water nor swimming in water, nor wading in water. With the mind-feel leading [and the body following] one can immediately become flow; this is absorption in out-of-water contexts. This cannot be achieved by simple nor yi quan standing and stepping; this can only be done while blending and becoming. 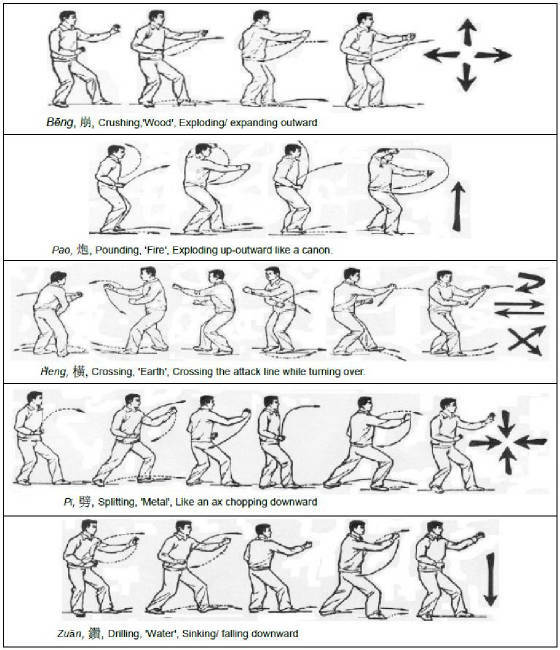 This is taught within ki-aikido to blend and be with actions; surprisingly, all of the usual 3-IMA's usually taught do not consider this or else it becomes an item taught after 'pushing' hands. This is not the same. Also, every styling of LHBF that I have seen does not include this principle. Water is a metaphor for fluidic-flow and property-change: it is known dynamic-Qi- 'feel' linked to, but is led by, intrinsic-dynamics, not mind. A central vertical axis supports the fludic peripheral body and directs this axis to retain optimal-vertical 'heaven-earth' alignment. 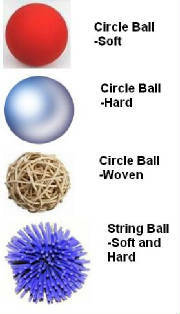 as a Ball: Human nature lends itself to being: soft, hard, or empty, loose-string-spagetti, and pivotal-spot. A ball is a symbol-metaphor: both a form and dynamic reference-standard. A ball can be soft, solid, and empty-shell. A spot can be stretched to a string. ...spheres encircle, companion and enjoin. 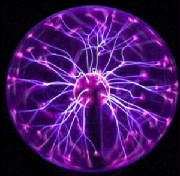 Cojoined,...solid, liquid, and gas...is called plasma. Most 'practitioners' of Chinese or other martial / health exercises prefer to 'name' their activities...in the wrongful belief that they are uniquely different. To them, tai-chi-is not xingyi-, nor is it bagua-. It is factual to say, they are variants of one another and that their hand motions fundamentals are reducible to 'crossing'. The differences are standing and stepping...and this also can be shown to be interchangeable. 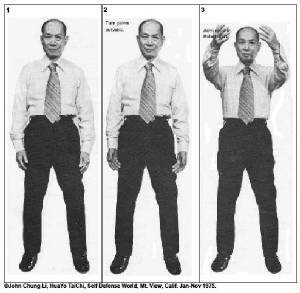 The 'waving hands' taken from a 'tai-chi-' exercise, when done while walking forward, become a crossing-over; this becomes a 'single palm change' when turning while stepping. This crossing trait, played out while varying the directions and stepping, is basic to 'water' style. 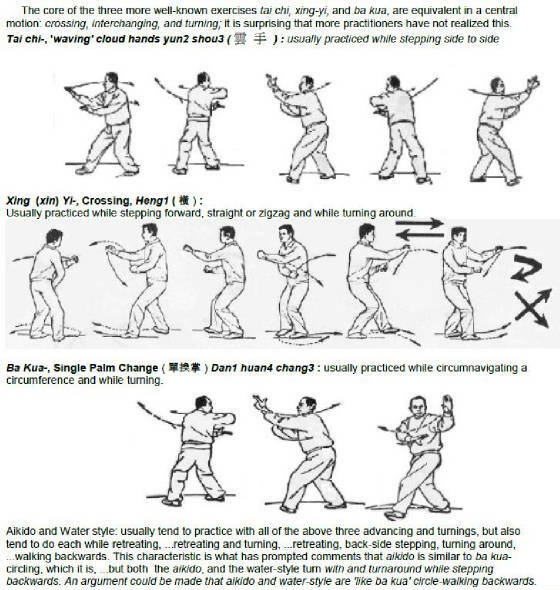 An adept thinker will note that viewed in sections, crossing-side to side could then also become 'wing chun' motions. 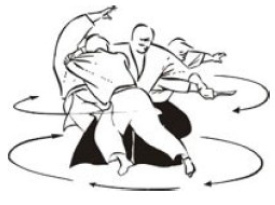 Also, the circle-walking done in reverse stepping can become as 'aikido'. a series of interlocked, distributed motions :...expanding, increasing, exchanging, condensing, falling-sinking. 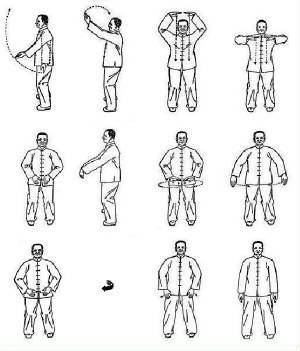 Due to the motion relatons, it has been sugested that there 'may' have been of some influence upon the later exercises, xing-yi- or as xin-yi-, and also upon the health preserving exercises, 'sporting of five animals' generally attributed to [but unproven] physician, Hua Tuo. ...Spirit [espirit] leads, the esoterics and physical follows. part of the eBook publication.